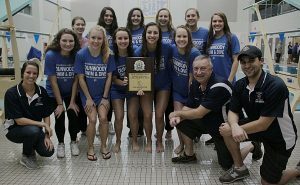 Championship streaks remained intact on Saturday at the Chamblee High Natatorium as the Chamblee Bulldogs (5) and Dunwoody Lady Wildcats (3) retained their titles at the DeKalb County Swim and Dive Championships. 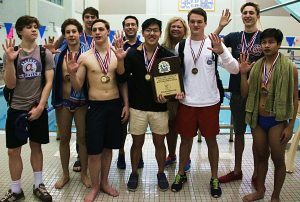 The Bulldogs won their fifth consecutive title (2013-2017) behind sweeping all three relay events and a pair of gold medal performances by sophomore Liam Bell in a 252-201 win over Dunwoody with Lakeside coming up one point short of its fifth consecutive runner-up finish with 200 points. Chamblee opened the meet by taking the gold in the 200 medley relay for the sixth consecutive year with a time of 1:43.24 by the team of Louis Cardot, Alex Miretsky, Brian Fadjariza-Dumais and Theo Hardy. Noah Oh followed that win up with his fourth consecutive DCSD gold in the 200 freestyle even with a time of 1:47.77. 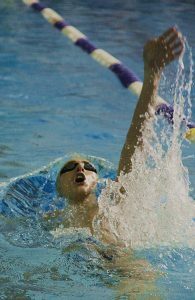 Liam Bell made it three consecutive Chamblee event winners as he won the 200 individual medley for the second consecutive season with a time of 1:58.11. 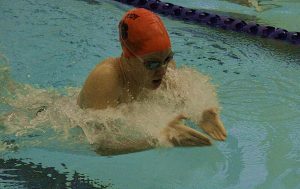 The next event win for the Bulldogs came in the 200 freestyle relay for the fifth consecutive season. Miretsky, Hardy, Oh and Bell put together a time of 1:28.75 for the gold. Bell would come back to win his second consecutive DCSD gold in the 100 breaststroke with a time of 59.78. The Bulldogs wrapped up their title in grand style by winning their fourth consecutive 400 freestyle relay gold as Fadjariza-Dumais, Cardot, Oh and Bell swam to the top of the podium with a time of 3:16.77. Dunwoody’s best team finish since 2012 was fueled by Grant Allison and Christopher Thames who each won two individual gold medals on the day. Thames won the 100 butterfly with a time of 51.29 and came back to break his own record of 51.15 he set a year ago in the 100 backstroke with a time of 50.94 for his second gold of the meet. Allison swept the sprint races taking the 50 freestyle in 22.18 and the 100 freestyle in 48.13. Other gold medal winners include new diving record holder Sam Witcher of Lakeside who put up 490.25 points in his 11 dives to break the old record of 37-year-old record of 442.60 set by Doug Dawson in 1980 and Decatur’s Jake Abrahamse prevented Chamblee’s Noah Oh from winning his fourth consecutive 500 freestyle gold with a time of 4:53.39. Overall 48 state qualifying times were met in the boys’ competition including all event winners. The girls’ championship had the same two teams atop the standings as Dunwoody captured its third consecutive title and its 16th overall 269-208 over Chamblee. Allie Reiter won her 6th and 7th gold medal in DCSD competition as she captured the 200 individual medley (2:11.40) for the third time and the 100 breaststroke (1:05.82) for the fourth consecutive year. Other individual gold medals for the Lady Wildcats came from Laura Spratling in the 50 freestyle (24.83), Sydney Sloan in the 200 freestyle (2:03.08) and Lauren Davis in the 1 meter diving (419.85). just behind at 3:42.99 to also eclipse the old record as Foelske almost caught Reiter at the finish. Chamblee’s second place finish was fueled by a win in the 200 medley relay by the same team that finished runner-up in the 400 freestyle. The group swam a time of 1:54.64 to earn the gold. Foelske picked up a gold in the 100 freestyle with a time of 53.29. Other gold medal winners include Julia Shuford of Lakeside in the 500 freestyle (5:18.09) and Nadine Abrahamse of Decatur in the 100 backstroke (1:02.57). Overall 43 state qualifying times were met in the girls’ competition including all event winners.